March 26, 2015 (Ramona) -- This Saturday, March 28th,te Ramona Music Fest will feature emerging talent and popular San Diego musicians playing everything from rock to reggae and from country to Americana. This all-day outdoor event benefits the Ramona Rotary and Kiwanis Clubs. It will be held at the Ramona Outdoor Community Center, 421 Aqua Lane in Ramona. February 26, 2015 (San Diego’s East County)--This week’s Destination East County includes rock climbing, live jazz and R&B concerts here in East County. Plus we’ll have a preview of coming attractions including St. Patrick’s Day festivities, the Ramona Music Fest a Shakespearean play with a contemporary twist, and Vallecito Day--celebrating our frontier heritage. Stay tuned for all of these events and much more, from East County Magazine. FEEL THE BEAT AT THE RAMONA MUSIC FEST MARCH 31! 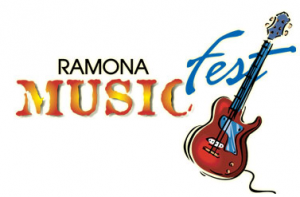 March 25, 2012 (Ramona) – The Ramona Music Fest is Saturday, March 31 from 12:00 p.m. to 5:00 p.m. at Dos Picos County Park, 17953 Dos Picos Park Road in Ramona. A variety of exceptional music artists will light up two stages. The headliners this year are Rockola and Cactus Twan Whyte Grano & Nash.Rockola has earned no fewer than eight San Diego Music awards in their three decades together. Cactus Twang Whyte Grano & Nash offer spot-on performances of beloved classics made famous by Crosby, Stills, Nash and Young. Read more about FEEL THE BEAT AT THE RAMONA MUSIC FEST MARCH 31! March 19, 2010 (Ramona) – From country music to rock and roll, from barbershop to Americana, you’ll find music to suit your fancy at the Ramona Music Fest this Saturday, March 20 from 2 to 6 p.m. Cactus Twang and White headline this year’s event, featuring Cactus Jim Soldi, former guitarist for Johnny Cash. March 8, 2010 (Ramona) -- The Ramona Music Fest benefit concert is March 20, from 2 to 6 p.m., at Dos Picos Park, 17953 Dos Picos Park Rd. in Ramona. The third annual event hosted by Ramona Kiwanis and Ramona Rotary clubs will feature two stages and wandering musicians.